IEC 61010-2-010:2019 is available as IEC 61010-2-010:2019 RLV which contains the International Standard and its Redline version, showing all changes of the technical content compared to the previous edition. 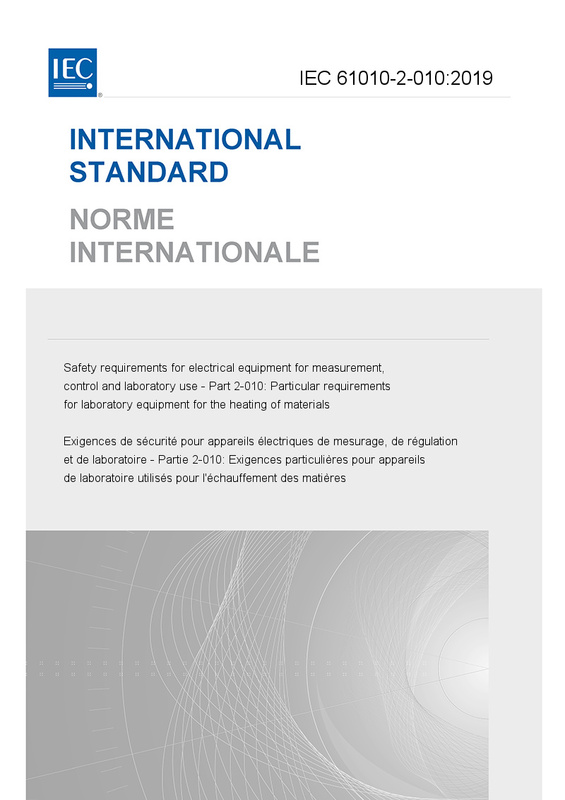 IEC 61010-2-010:2019 specifies particular safety requirements for the following types a) to c) of electrical equipment and their accessories, wherever they are intended to be used, whenever the heating of materials is one of the functions of the equipment. a) Electrical test and measurement equipment This is equipment which by electromagnetic means tests, measures, indicates or records one or more electrical or physical quantities, also non-measuring equipment such as signal generators, measurement standards, power supplies for laboratory use, transducers, transmitters, etc. b) Electrical industrial process-control equipment This is equipment which controls one or more output quantities to specific values, with each value determined by manual setting, by local or remote programming, or by one or more input variables. c) Electrical laboratory equipment This is equipment which measures, indicates, monitors, inspects or analyses materials, or is used to prepare materials, and includes in vitro diagnostic (IVD) equipment. This fourth edition cancels and replaces the third edition published in 2014. This edition constitutes a technical revision. This edition includes the following significant technical changes with respect to the previous edition: a) alignment with changes introduced by Amendment 1 of IEC 61010-1:2010; b) alignment with IEC 61010-2-011 and IEC 61010-2-012: - new matching Introduction clarifying which standard(s) to use; - new 5.4.101 instructions for flammable liquid; - subclause 9.5 on flammable liquids replaced with text from IEC 61010-2-012; c) subclause 5.2.101 deleted; d) requirements in 10.101 b) and c) clarified. It has the status of a group safety publication in accordance with IEC Guide 104.